tl;dr: Averaged historical data for US VC shows declining venture deal volume, and rebounding investment. Collating and tallying venture capital performance is a fun game, as varying sources have their own set of rules concerning what counts and when it should be counted. Late-stage private equity, leaked funding dates, different methods of deciding what counts as seed and so forth are important issues that are often treated differently by separate groups, for example. 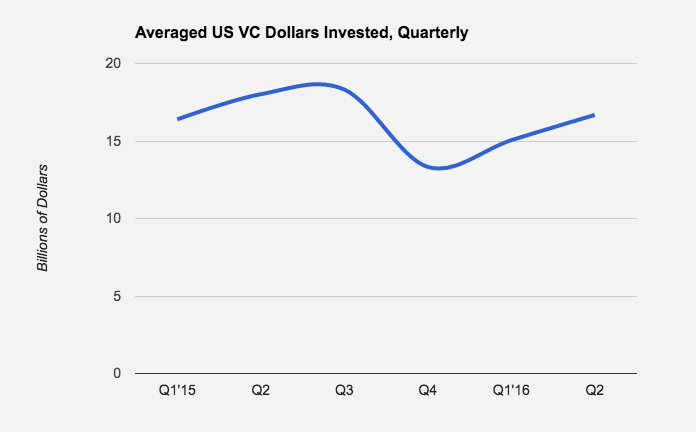 Mattermark’s most recent venture capital report, dealing with the second quarter, showed a decline in rounds compared to the preceding quarter and the year-ago quarter, and declines across the same timeframes for dollars invested into companies based in the United States. The data published here, however, discounts private equity at the late stage—on purpose—among a few other rules. So in the name of fun, I dug up several other data sources and ran an averaging bent through the information to answer a simple question: When you sum everyone together, what does the chart look like? The charts move in tandem directionally, with a few caveats. First, the third quarter 2015 dollar volume number bucks the deal volume decline, and second that the most-recent-quarter’s dollar volume again goes against its deal volume analog. In those cases, a presumably higher per-deal dollar amount solves the dissonance. More dollars and fewer deals means more dollars per deal on average, just as the opposite leads to thinner per-deal capital disbursement. That’s simple enough. I think the above charts show the tail-end of the bull cycle that built up the current heights of American venture capital and its requisite startup landscape. The third quarter of 2015 contained in it the August stock market correction. Deal volume then put up three consecutively lower results. The same goes for dollars invested. The first quarter included a successive public market correction that led to another decline in deal volume, even as dollars invested grew on a sequential basis in the following quarter. It isn’t too hard to guess why. 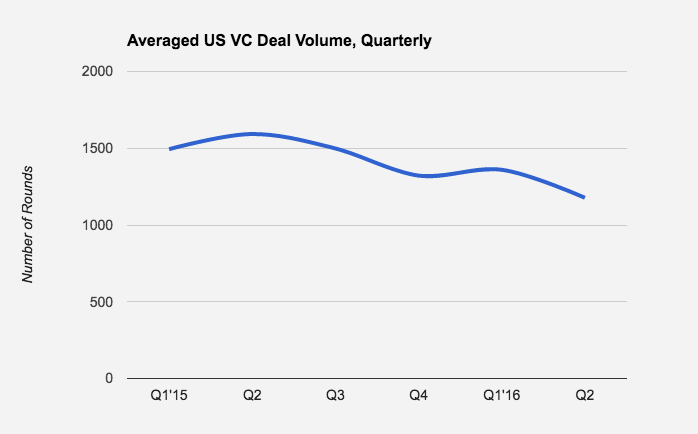 As you might recall, Mattermark data showed a sequential decline in second quarter dollar volume for VC investment into United States-based companies. As noted before, our metrics that for this sort of thing discount private equity. Private equity tends to invest at the top of the value arc, meaning bigger checks. Bigger checks skew deal averages up, and thus we have a decent guess at why the averaged source figure shows a rise in second quarter investment even as deal volume slowed. Complex? To an extent, but what it means is the squeeze we currently see on some younger companies looking to raise money is likely real. And that there is still an ocean of active capital. Looking ahead, it will be interesting to see if the venture community can stay above the averaged 1,000 quarterly deal mark, and over the $10 billion spend pace. Eventually things have to change. According to the NVCA, for example, venture capitalists that count in our above analysis raised $12 billion in the first quarter, a figure that was the highest on record since 2006. Given that, the pace we are seeing the venture community spend will eventually become unsustainable it seems; when the spend comes down to the raise, the impact on startups will be more than interesting. That’s the rough cut. Deal volume is falling over time, as dollar volume gyrates in between recent highs and lows. There’s plenty of money out there yet, so if you were looking to raise and haven’t yet, the best time aside from already is yesterday. Get on it.